If you’re too scared or jaded to get excited for a quick resolution to the Dodger ownership kerfuffle, much less a quick and happy one, I can definitely relate. A Delaware judge presiding over the Los Angeles Dodgers bankruptcy issued an order Friday scheduling a hearing that could determine the fate of the team and said he expects baseball Commissioner Bud Selig and Dodgers owner Frank McCourt to testify under oath. Gross said he must decide whether the Dodgers’ plan to auction off television rights to future games as the way out of bankruptcy is in the team’s best interest, or whether Major League Baseball can dictate what the Dodgers can and cannot do. “There is no middle ground for decision,” he wrote. Gross said an early resolution of issues in the bankruptcy case will allow the team to use the offseason to prepare for the 2012 baseball schedule. … Attorneys for the Dodgers, claiming the team has been treated unfairly, have sought to gain information from the league about its dealings with other clubs. But in his scheduling order, Gross said he will limit discovery in the case to the league’s relationship with the Dodgers. “The court will not turn the debtors’ ills and whether the commissioner is treating debtors and Mr. McCourt unreasonably and vindictively into a sideshow of all of MLB,” the judge wrote. … According to Salerno, Gross’ order refocuses the case on McCourt’s essential reason for taking the Dodgers into bankruptcy — to get the television contract that Selig would not approve. Such a contract has been opposed by MLB, Fox Sports and Jamie McCourt — Frank McCourt’s ex-wife, who claims half-ownership of the Dodgers. Salerno said Frank McCourt and his attorneys could try to introduce evidence about other teams in two ways: one, with cross-examination of Selig; two, with an expert witness who could discuss publicly available information — for example, a sports business analyst who could discuss the Marlins’ leaked financial documents. In a court filing Friday, the Dodgers listed their “bankruptcy-related expenses” for the first three months of the case at $5.7 million. Today, 22-year-old Matt Moore threw seven shutout innings in his postseason debut for Tampa Bay and achieved a Game Score of 77. He became the 11th-youngest pitcher with a postseason Game Score of at least 75. Fernando Valenzuela has the top two spots on that list, according to Baseball-Reference.com. Former Dodger Derek Lowe, who is owed $15 million by the Braves for 2012, is not expected to have a spot in the team’s rotation, according to David O’Brien of the Atlanta Journal-Constitution (via MLB Trade Rumors). The deadline to tender a contract offer to arbitration-eligible players (such as James Loney) is December 12. Best wishes to Geoff Young, who is retiring one of the original baseball blogs, Ducksnorts, after 14 years. Entering their first offseason in years without former vice president and assistant general manager Kim Ng to rely upon, the Dodgers have named Alex Tamin director of baseball contracts, research and operations. Tamin, who has spent more than 15 years in MLB player salary arbitration cases and contract negotiations, will be Colletti’s point person in those areas. He has also had a commercial litigation practice. “After working for the Dodgers from the outside for the past decade and knowing their history as one of the most storied franchises in baseball, I am looking forward to the opportunity to contribute to the Dodgers’ continued success,” Tamin said in a statement. With Ng, the Dodgers had a nearly impeccable record in avoiding arbitration hearings and winning them when they did occur. As contract negotiations with Matt Kemp, Clayton Kershaw and more are set to resume, Tamin’s position is one of potentially keen importance. Is award a case of brains vs. Braun? When I read the news release that Dee Gordon had been named National League Rookie of the Month, I didn’t get far before I realized that maybe he shouldn’t have won the award. Not that I wasn’t pleased for Gordon or happy with his performance, but the first player under “others receiving votes,” Washington catcher Wilson Ramos, had a higher on-base percentage and slugging percentage. Now, Ramos didn’t play as many games, and he didn’t have Gordon’s steals or his NL-high 42 hits, but it’s not as if I can’t see the case for the non-Dodger. So when I see that Ryan Braun has been named NL Player of the Month for September, when Braun’s on-base percentage, slugging percentage, OPS, RBI and runs created were lower than those of Matt Kemp (and other players), I feel I’m entitled to raise an eyebrow or three. Note, by the way, that the confusing word “valuable” does not appear in the award. It’s funny – I don’t really have my heart in this post (and I certainly don’t have any anger), because I happen to think Braun is a great player. That division-clinching home run he hit, boosting Milwaukee to its first title since the 1980s, is something Brewer fans will cherish for a long, long time. I know this because I still cherish the division-clinching home run Steve Finley hit in 2004, boosting the Dodgers to their first title since the 1990s. … Assistant general manager Logan White was in Japan earlier this week to scout Tsuyoshi Wada, a left-handed starter for the Fukuoka SoftBank Hawks of the Pacific League, a source close to the team confirmed on Wednesday. However, the Dodgers’ interest in Wada, who will be eligible for free agency this winter and thus won’t require a posting fee before a major league team can sign him, is only preliminary. Kuroda hasn’t announced his decision for 2012, but Dylan Hernandez of the Times offered a clue about the righthander’s leanings. … But Kuroda was also a free agent at the end of last season and he wasn’t nearly as emotional then. Near the end of the Dodgers’ team meeting Monday, Kershaw stood up and announced he had something to say. He said he wanted Kuroda to return next season. 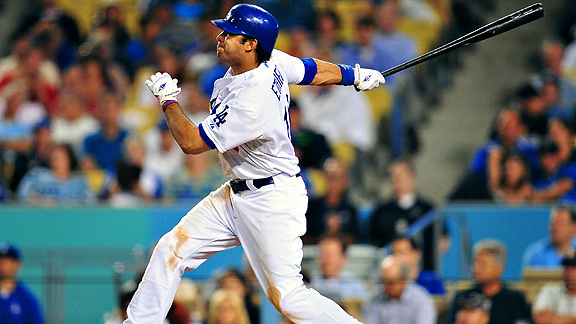 Gary A. Vasquez/US Presswire Andre Ethier might not have hit for power in 2011, but he’ll earn for power in 2012. Note: Salary figures marked with an asterisk are estimates. Contract and roster information has been researched, but corrections are welcome. Minor leaguers not on 40-man roster have not been included. Cot’s Baseball Contracts and True Blue L.A. were used as resources for some of the below information. * $420,000 Ivan De Jesus, Jr. So, you were maybe expecting some payroll relief for 2012? So long Casey Blake, so long Rafael Furcal, so long Jon Garland and Vicente Padilla and maybe Hiroki Kuroda and James Loney, hello dollars to spend? Because several Dodgers from Clayton Kershaw and Matt Kemp to (gulp) Juan Uribe are getting huge raises next year, the Dodgers already have approximately $100 million committed to next year’s roster. And if they don’t surrender exclusive rights to Loney, you can bump that total even higher. This is a $100 million team even without Prince Fielder, Albert Pujols or Henry Aaron. This is a $100 million team even with Dana Eveland and Nathan Eovladi in the starting rotation, even with A.J. Ellis, Dee Gordon, Justin Sellers and Jerry Sands in the starting lineup, even with a bench in which the highest-paid, most experienced reserve is Trent Oeltjen. Blame Kershaw (if you dare blame the greatest lefty pitcher in a Dodger uniform in the past 30-to-45 years) for the biggest payroll hike. After making $500,000 this season, Kershaw is eligible for arbitration for the first time this winter. Tim Lincecum, at a similar point in his career, asked for a $13 million in arbitration while the Giants offered $8 million; the parties agreed to a two-year contract averaging $11.5 million. I originally estimated $11 million for Kershaw in 2012, but others online have suggested that he won’t get more than the $8 million that was actually Lincecum’s base salary in 2010. So I’m compromising with a $9 million estimate for Kershaw – and if that’s too high, it’s not going to be too high by much. And then, the backloaded contracts of Uribe and Ted Lilly move to the fore. Uribe, who earned $5 million while reaching base 78 times in 2011 with a .557 OPS, will get direct deposits totaling $8 million in 2012 as he aims for the Comeback Prayer of the Year Award. Lilly, with a 2.32 ERA since August 1, jumps from $7.5 million in 2011 to $12 million in 2012, including a deferred $1.5 million of his signing bonus. Oh, by the way, middle reliever Matt Guerrier can also increase his 401(k) allocations, his salary bouncing from $1.5 million to $4.75 million, while Chad Billingsley’s three-year contract extension launches with a $9 million rate for 2012, up from $6.275 million this year. For seven players – Kershaw, Kemp, Either, Uribe, Lilly, Guerrier, Billingsley – the Dodgers will pay $69,250,000. Maybe more. Then there’s the deferred money going to players no longer on the Dodger roster. This causes great handwringing every year, and all I can say up front to the handwringers is, you need to get over it. Yes, the $8 million-plus going to Manny Ramirez is painful, but at least Ramirez helped the Dodgers reach the National League Championship Series twice. Yes, the $3 million-plus going to Andruw Jones underscores the need for “root canal” to come in adjective form, but without restructuring Jones’ contract or an alternate reality in which the McCourts weren’t such avid homeowners, the Dodgers don’t get Ramirez in 2008. These and other payments, such as the $1.25 million expected buyout of Blake’s 2012 option, add up to more than $21 million for 2012, according to the information compiled by Cot’s Baseball Contracts and True Blue L.A. It’s unfortunate, and exceedingly problematic for the coming year. But teams across the country have bad contracts. The Dodgers, while perhaps elite in this respect, are not unusual. In any case, add in the non-Dodger payments to our original seven, and Los Angeles is now shelling out roughly $91 million with 18 spots on the active roster to fill. The good news is that several of those spots can be filled cheaply with some promising players. For example, pitchers Eovaldi, Kenley Jansen, Javy Guerra, Scott Elbert, Josh Lindblom and Rubby De La Rosa (paid while he’s on the disabled list) should each make below $500,000. (The last thing the Dodgers should do is spend money on an overpriced veteran reliever.) Same with guys like Dee Gordon, Jerry Sands and A.J. Ellis. But if, for example, the Dodgers plan an upgrade over Justin Sellers in the infield, or Eveland in the rotation, that’s going to cost. That makes what happens with three players particularly intriguing: Loney, Hiroki Kuroda and Hong-Chih Kuo. Loney has made the case for his return with a strong final push, but do the Dodgers think he’ll be worth $6.5 million or so in 2012? Kuroda has become like Vin Scully in making us wonder every year whether he’ll return. Kuroda, who earned $8 million plus performance bonuses in 2011 but is owed another $1.5 million next year no matter what happens, is a year older but coming off his best season as a Dodger. If he comes back, expect him to earn a similar salary. But will he come back? As for Kuo, despite his difficult 2011 season, he would easily go up from $2.725 million in 2011 if the Dodgers didn’t release their exclusivity on him. But it seems more likely that Los Angeles would non-tender him and then try to sign him as a free agent at a lower rate, if he doesn’t retire and open a restaurant first. And if they go without any of these guys, will it be to save money to fill the rotation, save money to get the big-fish infielder like Pujols, Fielder or Aramis Ramirez, or to save money, period? Would they consider validating Ethier’s worst fears and moving him for salary relief? As much as Loney’s worth has been questioned, Ethier stands to make about twice as much as Loney in 2012 despite a 2011 OPS that is only .042 higher than Loney’s. It’s difficult to say what the bottom line is, given that we don’t know what the Dodgers’ top payroll limit is. If Frank McCourt wins in Ownership Court anytime soon, anything’s possible. But if he loses, or if – as is most likely – the saga remains “to be continued,” the Dodgers are in for some hard decisions. It’s a little funny to end a night at the Happiest Place on Earth and find you’ve been missing the Greatest Night in Baseball History. I will admit I saw .108-hitting Dan Johnson on MLB Gameday hit the game-tying homer in Tampa Bay on my phone just after the parade on Main Street ended, but otherwise, I’ll leave the coverage of the night’s events to those who saw them. I hope you were among them. In the meantime, congrats to Matt Kemp on his 39/40, MVP season, congrats to Kenley Jansen on his MLB-record 16.1 strikeouts per nine innings, congrats to the Dodgers for finishing their season stunningly strong (and without a bad taste in our mouths from another final-inning collapse) with a 7-5 victory tonight in Arizona, congrats to Dee Gordon, Jerry Sands, James Loney and Ted Lilly for their rip-roaring Septembers, and a laurel and hearty handshake to Eugenio Velez, the new Sheriff of Rock Ridge. Thanks to everyone for reading and commenting and being part of the Dodger Thoughts family this season, from near and from far — it was, as always, a pleasure — and get ready for the offseason. It all starts Thursday. Dodgers at Diamondbacks, 6:40 p.m.
Ryan Roberts hit a walkoff grand slam with the Diamondbacks down by three runs in the 10th inning. Roberts is just the fourth player in MLB history to hit a walkoff grand slam in extra innings with his team down three runs. It was the second walkoff grand slam in team history. The first was May 9, 2000, also against the Dodgers. Damian Miller hit it off Orel Hershiser, with the game tied at 7 in the bottom of the 12th. The Diamondbacks came back from a five-run deficit to win the game in the bottom of the 10th. The rally started with none on and two outs. This is the first time a team has ever performed such a feat in an extra-inning game. The last time a team came back from at least five runs down with two outs to win was July 28, 2001 when the Pirates came back from down six and two outs in the bottom of the ninth inning against the Astros. Coincidentally, this game ended on a walkoff grand slam as well, by Brian Giles. Bob Timmermann found this boxscore of a game in which the Pirates scored six in the bottom of the 11th after allowing five in 1991, though that rally didn’t start with two out. The home run allowed by Javy Guerra was only the second of his career in 46 2/3 innings, and led to his second blown save in 22 opportunities. Even now that his season is over, Hiroki Kuroda, who pitched six shutout innings with five strikeouts and no walks, hasn’t admitted to knowing whether he will come back to the Dodgers next year, writes Tony Jackson of ESPNLosAngeles.com. He finished the year with a 3.07 ERA, and in four years with the Dodgers has had a 3.48 ERA in 693 innings. There is one scenario that is possible but not necessarily conceivable, that being free agency could take Kuroda to another major league team. There were a handful of them in on him when he initially signed with the Dodgers, but when he re-signed with them last winter, there weren’t. Even if other teams have interest, there won’t be this time, either. The simple fact is, the only competition the Dodgers (81-79) will have for Kuroda’s services are the Carp. And that competition will be decided by no other factor than Kuroda’s whim, because the small-market Carp aren’t in a position to offer him anything close to what the Dodgers undoubtedly will. Based on two casual conversations I had with two Japanese reporter friends this week, it sounds as if the Carp probably can’t give him more than the equivalent of $2 million to $3 million. Jackson reports that the Dodgers will retain their entire coaching staff for 2012. That’s great news, especially in the case of Davey Lopes, who seemed to have such a positive effect on Matt Kemp, among others. Don Mattingly kept Kemp in the No. 3 spot of the batting order rather than moving him up in an attempt to boost his stats and award chances, telling Randy Hill of the Press-Enterprise, “It didn’t feel right” to make the switch. The offseason was calling, and I needed to answer. It was Back to School Night tonight at my eldest kids’ elementary school, so I missed the first part of tonight’s Dodger game. Then, when we got home, the place was a mess, the two big kids were hopped up on Wii, our youngest had a stomachache. And this was all before we found out he stuck a tiny bead up his nose. Before I became a parent, I used to hate to see the baseball season end. I recall watching the Marlins-Indians World Series back in ’97 (I’m not looking the details up, but I think I’ve got ’em right) in my bachelor apartment – Game 7, extra innings, a thrilling, exhausting night, long after the Dodgers had bid farewell to the year – and being in disbelief that there wasn’t more coming the next day, let alone the next year. Now, the offseason comes as a relief. An exhale. It’s not that I have stopped enjoying the game, but it really takes the pressure off when the Dodgers pack it up. (It’s not that I don’t watch any postseason games, but I can watch as much or as little as I want, completely passively.) I’m pulled in so many different directions that it’s nice to have one of them release me. Especially now. My kids haven’t been at their best lately. When you’re already questioning your parenting as much as I was today, you don’t feel good about parking yourself in front of the TV and the computer before their bedtime. So don’t tell my bosses, but even though I knew I had plans Wednesday evening that would prevent me from seeing the Dodgers’ final game of the season, I didn’t turn tonight’s game on. Not until the last kid was asleep, not until my wife and I scarfed down a 9:15 p.m. meal of McDonald’s while watching “New Girl,” not until I had spent another halfhour talking to my wife about how out of control things seemed. The game should have been over by the time I had lumbered upstairs, where I planned to put the finishing touches on a post I have planned for Thursday, the first day of Dodger winter, but according to MLB Gameday on my cellphone, it was the 10th inning. And even then, I wasn’t going to turn the game on – the only reason I did was that I realized after a few moments that this would be my last chance to hear Vin Scully for the rest of the year. The first play I saw was a baseball that hit, in rapid succession, the swinging bat of A.J. Ellis, the right-field wall at Arizona’s Chase Field and the face of Diamondbacks rightfielder Justin Upton. Upton slumped as the ball ricocheted away from him. He had suffered a concussion, I believe, thanks to a Tim Lincecum pitch Sunday, and what I gathered is that it was all he could do not to curl up into the fetal position. But Ellis was running, and the ball was rolling, and Upton realized after a palpable few seconds that the play hadn’t stopped. He had to get up and keep going. Ellis made it to third base with a triple (a career first, I’d predict, or maybe his second – but again, I’m not looking it up), driving in two runs to give the Dodgers a 6-1 lead in the 10th inning. Upton was walked off the field to the Arizona clubhouse, where he’ll essentially remain, I suspect, until the National League Division Series begins. I stuck with Vin for the remainder of the game, which went not completely unlike the 4+1 game from five years ago. Javy Guerra, who had been warming up before Ellis’ triple, sat down. Blake Hawksworth, in the role of Jon Adkins, entered in Guerra/Trevor Hoffman’s place, but got in trouble – starting with two out and the bases empty – when he was late covering first base on a grounder to James Loney. Guerra ended up coming into the game anyway, like Hoffman did, and it ended with a game-winning grand slam by Ryan Roberts. Los Angeles had scored five runs in the 10th inning and lost. And also, this: Matt Kemp had entered the game with a three-homer lead on Prince Fielder for 2011, and had been tied. The Dodgers have played too well of late and Kemp has played too well all season for me to have any ill feelings about tonight’s result. It’s just one of those things, and honestly, the timing could have been a lot worse. And also, I’ve just had too many other worries. It’s still strange for me to say, but I feel the Dodgers have given me more pleasure than I had a right to expect this summer. With Kemp and Kershaw in particular, it’s been a season with heights that I’m not sure I’ll experience again for a long time. I need to get my parenting legs back, though, and I’m hopeful the changing of the seasons will help. Reds at Mets, 4:10 p.m.
Pirates at Brewers, 5:10 p.m.
Cardinals at Astros, 5:05 p.m.
Red Sox and Rays are tied. Braves lead Cardinals by one game. Red Sox at Orioles, 4:05 p.m.
Yankees at Rays, 4:10 p.m.
Phillies at Braves, 4:10 p.m.
More encouraging news on Bryan Stow: His family says he is getting stronger and more responsive. Pirates pitcher Paul Maholm made the case for Matt Kemp as National League Most Valuable Player in an impromptu Twitter debate with Pittsburgh Tribune-Review sportswriter Dejan Kovacevic. Kemp is poised to become the first Dodger to lead the league in homers and RBI since 1941 NL MVP Dolph Camilli, according to the Dodger press notes. Tony Jackson has a feature on Don Mattingly’s rookie season as manager at ESPNLosAngeles.com. At Stadium Journey, Paul Swaney has a review of Isotopes Park. The Dodgers have asked for a postponement of the Oct. 12 hearing on MLB’s motion to force sale of the team. Bill Shaikin of the Times has details. Shawn Tolleson, the highly regarded relief prospect and childhood friend of Clayton Kershaw, gets a short profile by Dylan Hernandez of the Times. Did Hiroki Kuroda decide the AL wild card? When Hiroki Kuroda chose not to waive his no-trade clause at the end of July, it left one of his leading suitors, the Boston Red Sox, scrambling. The Red Sox ended up picking up Erik Bedard from Seattle in the three-team, seven-player deal that sent Tim Federowicz and Stephen Fife to Los Angeles and Trayvon Robinson to Seattle. And then … well, let Gordon Edes of ESPNBoston.com tell the story. And that’s just the weather (scattered thundershowers, 60 percent chance of rain). Bedard came back from a 16-day absence because of a strained lat and sore knee last week against the Orioles and lasted just 2 2/3 innings, needing a staggering 51 pitches to record those two outs in the third. The Red Sox will need much more from him Tuesday night. Boston has surrendered a 10-game lead in the American League wild card race, thanks in large part to a 7.26 ERA for their starting pitchers in September, Edes notes. Kuroda has a 3.29 ERA since the trade deadline, though it’s 4.18 in a September that has seen him have neck problems. Perhaps going to Boston wouldn’t have helped, but I’m guessing the Red Sox would be happy to have him pitching on the East Coast tonight instead of for the Dodgers in Arizona. I’m a little concerned with the talk that Don Mattingly might have Matt Kemp bat leadoff to increase his chances (rather slightly, I’d say) of reaching 40 homers and 40 steals. It could spread the impression for potential Most Valuable Player voters that Kemp’s numbers were more of a gimmick in games that weren’t serious. Probably doesn’t matter much either way, but I’d leave Kemp at No. 3 and take his chances there. Meanwhile, when they talk about a player’s body in “Moneyball,” I don’t think they mean this. David Schoenfield of ESPN’s Sweet Spot asks if Kemp is having the greatest season ever by a Los Angeles Dodger position player. … According to Baseball-Reference WAR, his season ranks only behind Adrian Beltre’s 48-homer season in 2004, and just ahead of Mike Piazza’s 1997. In fact, forget limiting it to just Los Angeles. The only Brooklyn Dodger seasons that rate higher are two from Jackie Robinson, in 1949 and 1951. Today is the 75th anniversary of longtime Dodger manager Walter Alston’s one and only at-bat in the majors, writes Chris Jaffe of the Hardball Times. … on Sept. 27, 1936, he was just a young 24-year-old hoping to get his shot. He was a bit old for a prospect because he’d gone to college and only went pro after graduating. Russ Mitchell is having season-ending wrist surgery today, the Dodgers said. He is expected to play winter ball. A tight hamstring is expected to keep Rafael Furcal on the sidelines for the final two games of the Cardinals’ playoff push. And so, reluctantly, I shift gears away from the Triple Crown. It’s not impossible for Kemp to come back in the batting race, in the sense that he could go something like 10 for 10 in a 20-inning game Tuesday, while the other guys had big giant 0-fers, but it’s getting a bit dicey. A 40/40 season of homers and steals, on the other hand, remains very much alive, as does of course the National League Most Valuable Player trophy. Dana Eveland bounced back from two sub-par starts to shut out Arizona over 5 2/3 innings, with Josh Lindblom striking out Paul Goldschmidt for the final out in the sixth to strand three baserunners. And Justin Sellers took a break from a 7-for-63 slump (with six walks) by singling home a run in the seventh inning to give Los Angeles a 4-0 lead. In the eighth, Nathan Eovaldi walked the bases loaded with one out in his first action since September 17. Scott Elbert relieved, and a run scored on a passed ball by A.J. Ellis. After Elbert issued the fourth walk of the inning, Mike MacDougal relieved and got an eight-pitch strikeout of Goldschimdt, but then delivered walk No. 5 (“That’s called a low five,” Vin Scully said) to Geoff Blum for the second run. Finally, Dodger nemesis Gerardo Parra flied out to end the inning. With Javy Guerra pitching in the ninth, Dee Gordon (2 for 4) threw away John McDonald’s grounder for an error, then juggled a potential double-play toss from Sellers and was lucky to a) get a force and b) not get hurt by the oncoming McDonald. Ryan Roberts did something rather unexpected, trying to bunt for a base hit, and was thrown out easily for the second out. Aaron Hill popped to Kemp in center, and the Dodgers had their victory. The 2011 Los Angeles Dodgers have done something few, if anyone, expected this summer. With two games to play and an 81-78 record, they have clinched a winning record. Ryan Braun, and this is understandable, is getting a day (or at least a start) off before the playoffs. So unless he pinch-hits, his batting average should remain at .333. Jose Reyes grounded out in his first at-bat to fall to .330. Matt Kemp is at .324 as play begins tonight. Cliff Lee gave up a first-inning home run tonight, meaning that to catch Clayton Kershaw for the ERA title, he now needs to pitch into the 15th inning for the Phillies without giving up any more runs. Kemp was named National League Player of the Week. The Dodgers laid out their NL Cy Young Award case for Kershaw in this official release. Don Mattingly, bunts notwithstanding, is praised by Mike Petriello of Mike Scioscia’s Tragic Illness. Steve Dilbeck of the Times passes along KABC Dodger Talk host Josh Suchon’s fears that the Dodgers have improved so much, they could lose a first-round draft pick if they sign a Type A free agent. I’m still not sure the Dodgers will sign a Type A free agent. The Dodgers have recorded an “It Gets Better” video. I like seeing the organization step out in this territory. This statistical run-down comes courtesy of Mark Simon with ESPN Stats and Information. With 3 games left in the season, Matt Kemp has a slim chance to be the first Triple Crown winner since Carl Yastrzemski won it with the 1967 Red Sox. He would be the first Triple Crown winner from a National League team since Joe Medwick of the 1937 Cardinals. Kemp trails in the batting race by nine points and needs a hot streak to have a chance to win. To win the Triple Crown, a player must lead his league in batting average, home runs, and RBI. Kemp leads the NL in RBI and is closing in on the lead in batting average and home runs. The Dodgers have 3 games left with the Diamondbacks, all on the road. This could be advantageous to Kemp, because it ensures the Dodgers 9 innings of at-bats per game (instead of 8). Kemp is hitting .310 with 5 HR and 16 RBI in 15 games against the Diamondbacks this season. Red Sox lead Rays by one game. Red Sox lead Angels by three games. Rangers at Angels, 7:05 p.m.
Hope you know what the headline above refers to. Every National League batting race scenario you can imagine is provided by Eric Stephen of True Blue L.A. My personal nightmare: Matt Kemp gets 10 hits over the next three games, but Albert Pujols homers in his last at-bat. Tim Brown of Yahoo! Sports has two good pieces today, on McCourt v. Selig and on Kemp very much not v. Newcombe. Jay Jaffe of Baseball Prospectus has a good piece on Kemp, Clayton Kershaw and the Dodgers. Among other things, he notes that when “you factor in opponent quality and ballpark, (Kershaw) has done better against a slightly tougher slate of hitters than Roy Halladay and Cliff Lee” — a reminder that just because Kershaw has gotten to pitch against the San Francisco and San Diego offenses this year doesn’t mean he’s had it easy. Orel Hershiser and Eddie Murray make Chris Jaffe’s “Ten worst career-ending performances of all time” list at the Hardball Times.